Admiral Yacht Insurance is pleased to be members of the YDSA and we receive the Yacht Designers and Surveyors Association monthly newsletter, which highlights interesting technical topics in the marine world. We spotted Tony Tucker’s useful article on Boat Fire Extinguishers in the June 2016 newsletter, and the YDSA have kindly agreed to us reproducing it here, as over the past years we have had to deal with some major boat fires and insurance losses for our customers. The early use of a Boat Fire Extinguisher can buy time in the right circumstances and from the checks Tony makes in his role as a surveyor provides useful information for our Yacht Insurance customers in making sure the right types of Boat Fire Extinguishers are fitted and that they are serviced correctly and kept in good condition for when, god forbid, the worst happens. Please see below Tony Tucker’s article and we hope that it helps prevent any major fire disasters for you and your boat. You might also be interested in another article on our website which relates to the same subject of Boat Fires from when we did our Boat Crash Test with Yachting Monthly. 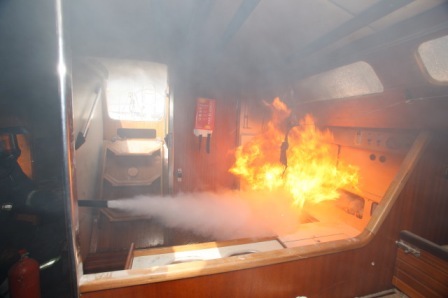 Fire on board a boat should be considered very scary as there is little space to escape and getting off could be difficult. We have all seen photographs of GRP boats still floating but, only from the waterline down as the rest is essentially gone. I was recently rung by an underwriter to investigate a boat fire which had only just happened involving a GRP boat on a trailer. I said that by the time the fire brigade, even if called within minutes of the fire starting, had arrived, the boat would be just a lump of misshapen plastic and some metal supports. He rang back later in the day to say he had the photographs and that I was right. It is the surveyor’s responsibility to check the portable boat fire extinguishers and recommend replacement/servicing as necessary as part and parcel of the ship’s husbandry. For most small extinguishers, replacement is generally cheaper than servicing. Fixed systems in boat engine rooms, etc. should be recommended to be examined by a fire expert. Portable boat fire extinguishers are dated, although this is frequently difficult to find but, should be read and noted. Some modern appliances have the main casing dated and the dispersal head. Class A: Fires with trash, wood, paper or other combustible materials as the fuel source. Class B: Fires with flammable or combustible liquids as the fuel source. Class C: Fires involving electrical equipment. Class D: Fires with certain ignitable metals as a fuel source. At one time the fire extinguisher body was colour coded for ease of identification with the type of fire. The current UK standards use a red bodied extinguisher with a colour banding (often the label) to indicate the extinguishing type. The letter indicating the type of fire and number indicating the firefighting capability are combined to create the fire extinguisher rating. Where a fire extinguisher is only capable of tacking one type of fire, it will only be marked with 1 rating e.g. 21A. Many commercial vessels will be fitted with a fire pump either powered or manual and hose. This is dependent on the ingredients of the powder with options of D only, B&C or A B C Most commonly found on-board boats usually with an A & b rating. The higher the rating the greater the power, i.e. Size matters! A 1kg dry powder general purpose extinguisher will last about eight seconds in use. A and sometimes B – suitability varies between different manufacturers. The one drawback is the large volume required. Previously widely used on boats as they were effective on a wide variety of fires as well as being a very efficient extinguisher. Halon however has ozone depleting properties and its use has been banned since the end of 2003. There was a 10-15 year phase out period. Despite this, there are still some Halon extinguishers in existence. Should you have one it should be replaced and the Halon extinguisher should be disposed of through an approved channel. It was not uncommon to find 6-12 month old fire automatic extinguishers in an engine room mounted horizontally completely discharged and therefore useless. Replacement for Halon 1211 in portable fire extinguishers, FE-3 has comparable performance and efficiency to Halon 1211, lower toxicity, as well as zero ozone depletion potential. Fire extinguishing aerosol generators use a stable aerosol forming solid compound. Upon activation the solid compound is transformed into a rapidly expanding, highly efficient and highly effective fire extinguishing aerosol, based on Potassium salts. It does not remove Oxygen or Heat from the fire. It simply inhibits the chemical chain reaction. The aerosol generators are completely safe, environmentally friendly and do not require high pressure cylinders or pipework. The dry water mist technology allows them to produce over 22 billion water droplets from only one litre of water. The droplets are as small as 25 microns in diameter and create an ultra-fine mist which has superior firefighting capabilities. The system creates water droplets producing a mist that leaves almost no trace and no collateral damage. These fire extinguishers are capable of tackling almost all common fires including class A, B, C, F and electrical fires. The unique water mist has the normal cooling effects of water and creates a “mist curtain” cutting off the oxygen supply. The droplets are so small that they have no adverse reaction with burning liquids allowing use on class B and F fires. Not to be forgotten, the trusty fire blanket usually manufactured to BS 6575 or BS 1869. Many fire extinguishers are pressurised vessels and therefore they require pressure testing every ten years. Don’t be fooled by a “gauge in the green” as a boat is a vehicle subject to vibration which will compact powders and thus render them useless. Many fire extinguishing systems require regular servicing or maintenance and these should be checked wherever possible.